Physics and liberal studies Professor David Mitchell led a team of aspiring educators on a journey to develop a curriculum designed to inspire young students to be curious about our galaxy. View the Flickr Album from this story! The team of four undergraduates assembled a receiver and two antennas capable of listening to radio waves from both Jupiter and the sun. The future teachers plan to apply what they learned to develop a curriculum for local elementary school students at San Benito Elementary School in Atascadero. “These Liberal Studies students will be elementary school teachers, and so getting the experience of creating a science curriculum is helping develop their skills to become a teacher in the classroom when they graduate,” said Mitchel. Aileen Saucedo, Carly Muller, Sara Bettencourt, and Sarah Coyle, all fourth year Liberal Studies majors, learned new skills ranging from assembling and soldering together the main receiver, to using power tools, to take precise measurements. The research team also worked together to solve problems as they built the antennas, which they’ll use to listen to storms caused by the interaction between Jupiter’s magnetic field and its closest moon, Io. MY FAVORITE IS THE HANDS-ON PART THAT I NEVER THOUGHT I WAS REALLY GOOD AT OR INTO, BUT AFTER DOING THIS PROJECT I REALIZE THESE ARE PRACTICAL SKILLS I’LL HAVE FOREVER. “My favorite is the hands-on part that I never thought I was really good at or into, but after doing this project I realize these are practical skills I’ll have forever,” added Coyle. This summer research opportunity allows these students to test their skills and apply what they’re learning in their major to develop curriculum for the first time. 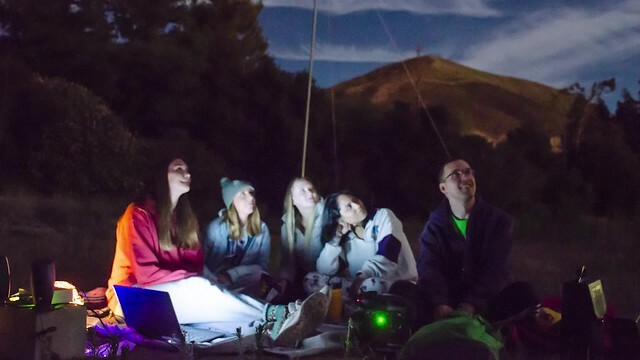 Their classroom activities will use Cal Poly’s Learn by Doing approach to teach elementary school students about astronomy and magnetic fields. “Doing this project before entering the credential program is definitely giving me a lot of confidence because I’m getting step-by-step experience in writing a curriculum long before I finish my undergrad,” said Bettencourt. The first stage, now complete, is building the equipment and gathering observations. In this stage, the team gained the first-hand experience that they’ll use to develop their curriculum. In stage two the students develop their curriculum using what they’ve learned during their summer research. This stage happens during the fall and winter quarters in the form of individual senior projects. Eventually, the students will also build an antenna at San Benito Elementary School to support their curriculum.